“Whether you live on the coast or hours from the closest beach, we all depend on the ocean. 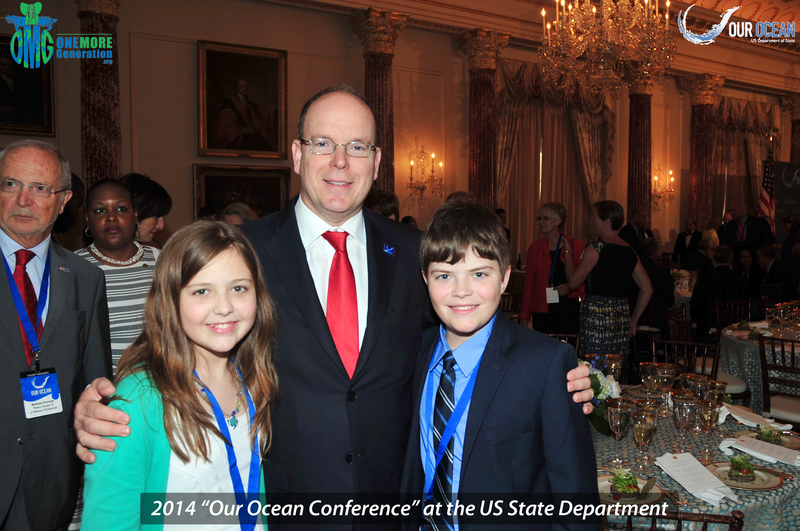 The ocean is critical to maintaining life on Earth, contributing to our livelihoods and our well-being. It regulates our climate and weather, it generates 50 percent of the oxygen we breathe, and it absorbs excess carbon dioxide from the atmosphere. The ocean also plays a vital role in the global economy by providing food and a source of income for millions of people. More than one billion people worldwide rely on the ocean for their primary source of protein. The ocean is just too important to ignore. Yet, the ocean is facing significant challenges, some stemming from a lack of awareness and some from a lack of will. Some of these challenges are well known – like unsustainable fishing practices and marine pollution – and some are new to us – like ocean acidification. The good news is that there are solutions – and we know where to find them. 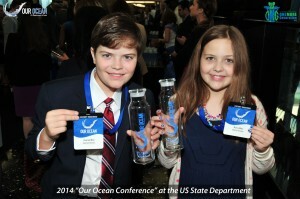 Could education be the key to saving our oceans? “Olivia” – As we attended the ‘Our Oceans’ conference at the State Department last week it became apparent that there are a whole lot of people and countries who care for the future of our oceans. We heard experts from around the globe weigh-in on such issues as ocean acidification, overfishing/illegal fishing and even about the issue of marine debris and plastic pollution. We were all so excited to see the level of participation from so many countries and the sincere compassion participants demonstrated as they mapped out their plans to help our oceans. It was especially encouraging to hear how much support both financially and legislatively most participants were prepared to offer as they learned about the perils facing our oceans globally. We heard pledges being made designed to protect even larger areas around various land masses and we were especially moved by the actor Leonardo DiCaprio as he committed an additional 7 million dollars to help create marine sanctuaries. But the one thing we did not hear… from anyone, was the word ‘education’. As future leaders of the next generation, we feel that everyone is missing a key component to the solution, and that is teaching kids (our generation) about ways they can get involved. 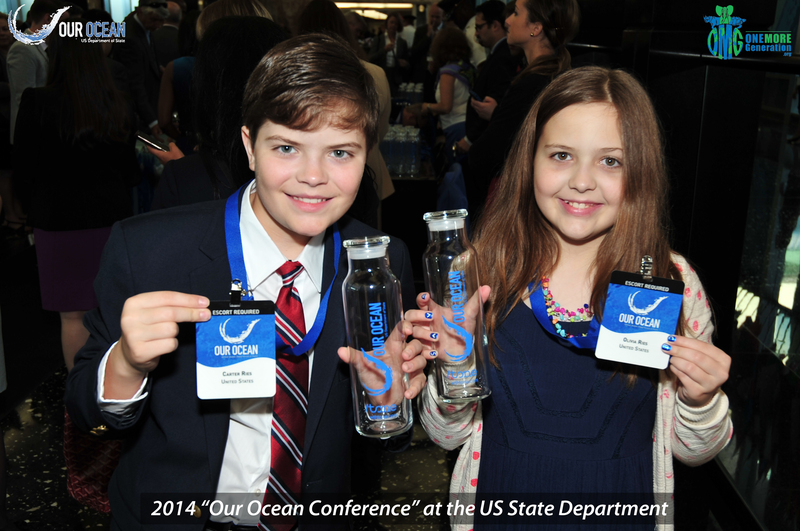 We know first hand that if you teach kids about the issue, they are all too eager to want to be part of the solution. species the opportunity to restore themselves to safe levels, or to seek ways we can work with manufacturers to ensure that they are producing less plastics etc. But, unless you incorporate some sort of global education program designed to reach the next generation of leaders, teach them at an early age, and show them how they can be the solution to the issue of plastic pollution, what have we accomplished? Plastic pollution will continue to find its way into our oceans and eventually into the very ocean sanctuaries being created. We are producing more plastic waste than can ever be recycled. Most people think that just because they are sending all their plastic trash to a recycle center, they are doing their part to make a difference, but the reality is that they are not. My sister and I travel around the country and have even traveled abroad visiting recycle centers and teaching kids about what we call “precycling” and how that actually is even more important than recycling. What we would like to see is that the US and other countries take a serious look at providing an educational component to their ocean strategy. We have already created a curriculum which was written to match the latest National Standards for science, and we have even infused math, literacy and art throughout the program. We learned about the issue of plastic pollution while helping with the animal rescue efforts during the BP Gulf oil spill, and we know first hand that if you give students the education they need on the issue, we can and will find the solution.